The chequered flag finally came down on Briggo’s incredible Motorcycle journey around the UK when he revealed his final total at a private reception in Solihull on 2nd December 2010 in front of invited guests and riders. 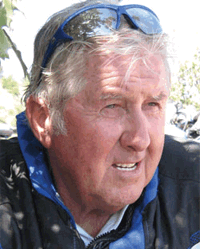 The 4-times World Champion revealed a heart-warming figure of over £68,500 had been collected in his 9 month campaign to raise money for twelve ex-speedway riders confined to wheelchairs after racing accidents. Briggo was presented with a cheque for the total amount before going on to hand over the cash to the benefitting riders, who each received over £5,000. Sport Relief also benefitted from the campaign with a proportion of the money going to them. The riders for whom the money was raised were: Krzysztof Cegielski, Lawrence Hare, Neil Hewitt, Per Jonsson, Pip Lamb, Graham Miles, Paul Mitchell, Joe Owen, John Simmons, Gary Stead, Steve Weatherley and Alan Wilkinson. Ride Secretary, Nigel Leahy, explained that around half of the money came from collections at UK speedway tracks as Briggo toured the country, but other means of topping up the fund were also extremely effective. Web donations through Paypal together with text payments (which alone raised almost £3,000) made it easy to donate. There was a further £8,000 of private donations and £5,000 in company donations to swell the pot. And, throughout the year sales of “Ride Share Certificates” which numbered over 100 drew in another £10,000. The Yamaha WR250R, ridden by Briggo on the journey and donated by Yamaha was the top prize in a draw made on the day exclusively for share certificate holders and the winner was James Easter from, Ipswich based, Travel Plus Tours, the popular Speedway travel specialists. 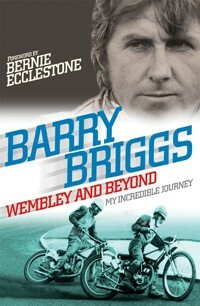 75 year old 4 times World Speedway Champion Barry Briggs MBE introduces his toughest challenge to date as he sets out his plans for a marathon charity motorcycle ride through the whole of the UK in 2010. to raise money for 12 stricken Speedway riders in wheelchairs. 4 times World Speedway Champion Barry Briggs MBE in Training for his biggest challenge, the Sports Relief Charity ride throughout the UK to raise funds for ex speedway riders in wheelchairs. Briggo calls on old friend Gary Lewin the England Football Team's Chief Physio for some advice before the event. 4 times World Speedway Champion, Barry Briggs kicks off his Sport Relief Charity Ride at Wembley during half time of the England v Egypt game in March 2010. FA Premiership Chairman, Sir David Richards, presents Briggo with the first big cheque to get the ball rolling on his UK tour to raise funds for Sport Relief and Barry’s own special cause for fallen heroes in wheelchairs. Ride along with 75 year old, 4 times World Speedway Champion, Barry Briggs in training near his home in California for his UK wide Charity Motorcycle Ride. Miraculously, Briggo survives this terrifying crash into a concealed hole, some 10ft deep, in treacherous country frequented by mountain lions!